DESCRIPTION: The Southern Arizona community of San Luis now has clean drinking water after flipping the switch on their new Manganese treatment plant that will process up to 2,200 Gallons Per Minute of the city’s potable water supply. In addition to exceeding the EPA mandated MCL’s by an order of magnitude, the manganese caused staining of fixtures and clothing as a result of oxidation, which is enhanced through the use of bleaching agents in household laundry. 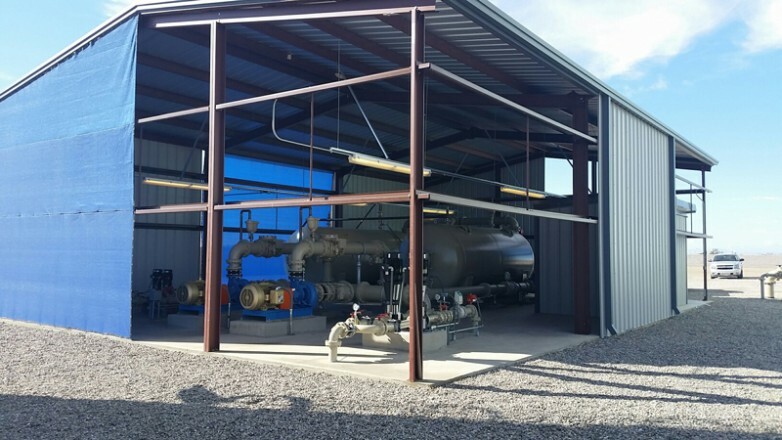 Integrated Water Services, Inc. (IWS) constructed the system, completed all the testing and start-up, and provided training for this $2mm potable water treatment system. The scope of work for the project included the installation of a complete Pureflow (www.pfdiv.com) Filtration manganese removal system for the drinking water plant at Well Site No. 7 which has two (2) groundwater production wells. The work also included replacement of the well pumps, constructing a 40’ by 60’ enclosure building and pad, 60,000 gallon reclaim tank, sludge mixing system, sludge sewer disposal, all mechanical piping (12” diameter), and all associated electrical and controls. The Pureflow Filtration system utilizes coagulation filtration with a permanent catalytic adsorptive media that can be backwashed and requires no regeneration or chemicals. The media is a highly efficient pyrolucite ore. The two filters can provide a total of 3.2 million gallons of manganese free water each day. The filters, the 99% efficient backwash water recovery system, solids fluidization, and transfer system is fully automated, which simplifies operation. The manganese in the drinking water is naturally occurring and is present in the raw water at a concentration of approximately 0.35 mg/l. The Pureflow system treats influent manganese from the raw well water down to non-detect levels of 0.02 mg/l or less.